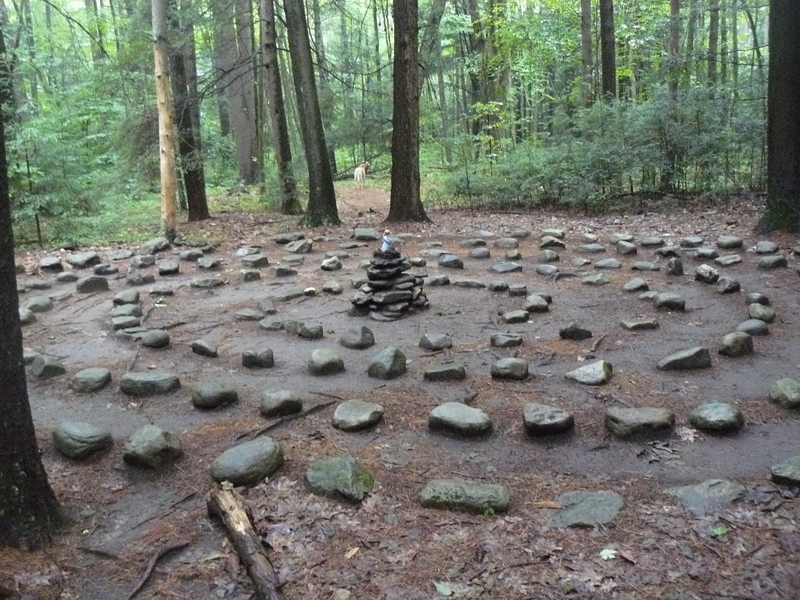 For a week now, I have walked right past the stone labyrinth. It appeared on the trail years ago. I don’t know the story of who made it or why, it doesn’t matter. It is now simply a place to stop and have a different kind of trail following experience. The first time I was walking around this path of evenly placed stones years ago I saw a black bear run by. There is some magic here for sure. When out on the trail with Nora the first time, I noticed there hadn’t been too many changes since the last time I walked this labyrinth. I was curious though about the new large, clearly manmade ditch located on the west side of the circle. It was loosely covered with branches and twigs as one might do when setting a trap. Right where I saw the bear! I let this fact register, and proceeded with the circular walk to the center to honor a first hike in these woods after so many years. The thing about a labyrinth is its clearly structured path that you can’t move off of easily. Even though walking steadily in the center of the path that day, I was acutely aware of how attention and energy went to one side of my body or the other depending on which way I was walking, ‘in’ or ‘out’. Like the large ditch within sight that wasn’t offering an explanation yet, I also registered this fact, gently exited the labyrinth, and went on my way with Nora. We arrive today later than usual, already 8:00 and still pouring. It was easy to stay in bed an extra hour with the sound of the steady rain and imagine we would skip our time on the trail. But once up the momentum to get here had me in rain gear and Nora in the backseat of the car in no time. She didn’t even stop to eat her breakfast! It is really wet. After a week of having solid dry ground underfoot, I am now having to skirt around large deep puddles along the trail. I move to the right, walk a bit there, then cross over to the other side between puddles, walk on the left a bit, cross over again, weaving back and forth like this all the way to the labyrinth. I’ve already decided I’m going to walk it this morning and head up the little incline to where it lives just a short distance from the trail. And find that the entire path of the labyrinth is also filled with puddles! I actually laugh out loud when I realize I can’t move to the left or the right but have to walk right through each one. Leave it to a good rainfall and well placed puddles to capture the spirit of a labyrinth. Walking carefully through each little body of water with clear awareness, I am now completely focused on staying centered in the path. How different this feels from the other day. How different this feels from negotiating the trail just now on the way here. Walking through the water is the center of me. Rounding the outer ring on the way out, my attention is once again drawn to the suggestive hole in the ground and I hear…‘the spirit of the bear is captured here’ …. Coincidence? I don’t think so….